USA Network rolled out a new branding campaign and tagline earlier this year. The slogan, “We the bold,” is not only short and simple, but also draws connections the network’s “all American” name and “We the people,” the first three words of the U.S. Constitution. The tagline is also used to promote some of the network’s lighter fare, including the “Chrisley” franchise and signing competition “Real Country” and can be alternatively interpreted as a reference to the strong characters and competitors in these programs. 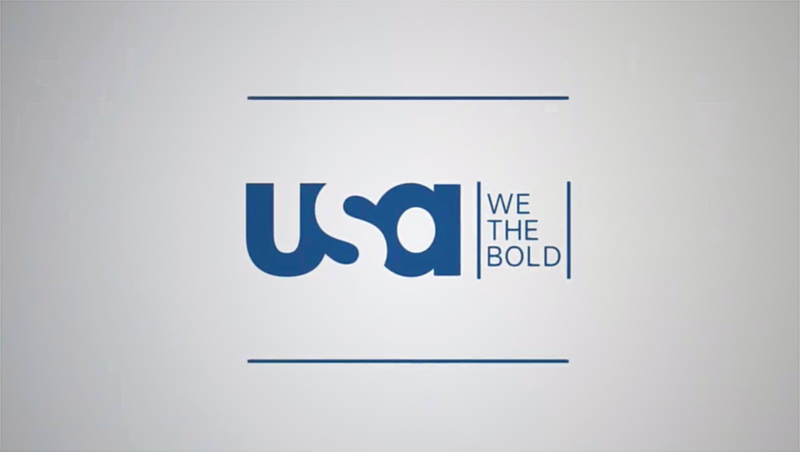 The network has retained integrated the existing typographic look (a font similar to Clobber Grotesk Light or Core Sans AR 45) as well as animated horizontal and vertical line “reveals,” including sandwiching the stacked “We the bold” tagline between two vertical lines parked next to the distinctive USA logo.